An Ordinary Georgian "Wants Lights!" REA dedication, Barnesville, Georgia. REA--somewhere near the stateline between southeast Tennessee and northwest Georgia, on the edge of TVA territory. TVA had created a desire for electricity in all adjacent areas. I recall seeing this sign during one of my visits to this area while a project was in the process of being organized. We had some trouble with the Georgia power Company in those early days about "spite lines," etc. Like other private power companies that " couldn't see the rural market" before REA started, they suddenly blossomed out either to discourage formation of rural cooperatives or to hinder progress by "spite lines." We finally bought some of these for the coops and rural Georgia went on to become one of the most widely electrified states. Georgia Power Co. (Charles Collier, their public relations chief) did not like it when I would not agree to their plan to take over all utilization or power use for all REA projects in Georgia "and thereby relieve REA of the expense of teaching use of electricity in rural areas." I reminded Mr. Collier I could not think of a better way to accomplish what the private power companies were saying, after they discovered they could not prevent formation of farm cooperatives and the building of lines "we will buy them for a song." I wonder why so many people in private industry think government administrators are simple minded. Well, we went ahead in Georgia, as elsewhere, minded our own business, fulfilled our obligations and built a strong REA. John Carmody. 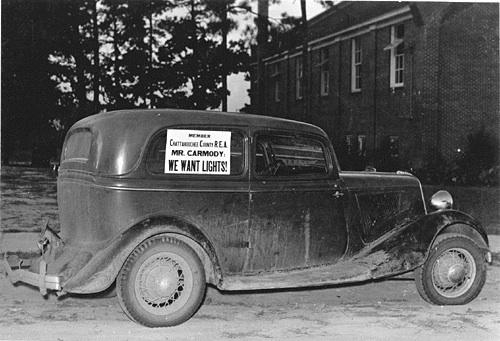 Source | "Car with Message for John Carmody," circa 1938, Franklin D. Roosevelt Presidential Library, available from the New Deal Network, http://newdeal.feri.org/library/photo_details.cfm?PhotoID=5678&ProjCatID=10082&CatID=5&subCatID=1016. Cite This document | Unknown, “An Ordinary Georgian "Wants Lights! ",” HERB: Resources for Teachers, accessed April 19, 2019, https://herb.ashp.cuny.edu/items/show/1513.